At a peaceCENTER’s meeting last week we were talking about the postal service and Andy quoted this poem, engraved on the pediments of the old District of Columbia Post office, now the Smithsonian’s National Postal Museum, at N. Capitol & Massachusetts Ave, NE, on Capitol Hill. 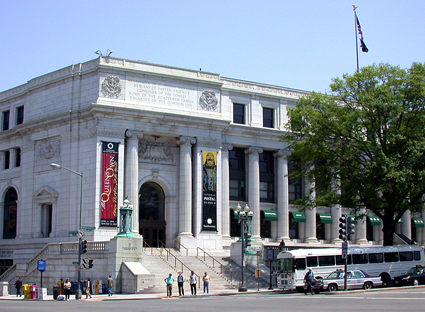 Built in 1914, this building served as the D.C. post office until 1986. (This is not the post office building on Pennsylvania Ave. that is now leased by the Trump Hotel.) The original of this inscription was called “The Letter” and was written by Dr. Charles W. Eliot, former president of Harvard University. President Woodrow Wilson changed the text slightly before the inscription was carved in the white granite of the Post Office. Messenger of Sympathy and Love / Servant of Parted Friends / Consoler of the Lonely / Bond of the Scattered Family / Enlarger of the Common Life / Carrier of News and Knowledge / Instrument of Trade and Industry / Promoter of Mutual Acquaintance / Of Peace and of Goodwill Among Men and Nations.